Researchers have come a long way in developing technologies that can mimic natural hearing in someone with severe hearing loss. But a new study could help these advancements take leaps and bounds toward restoring a person’s ability to hear through assistive technologies. A little green bug could open new doors in the field of Audiology, so let’s take a look at what all the “buzz” is about! The bush cricket is a two-tone, light green cricket native to the Eastern US. As with many insects, they are called by many names, depending on where you live. 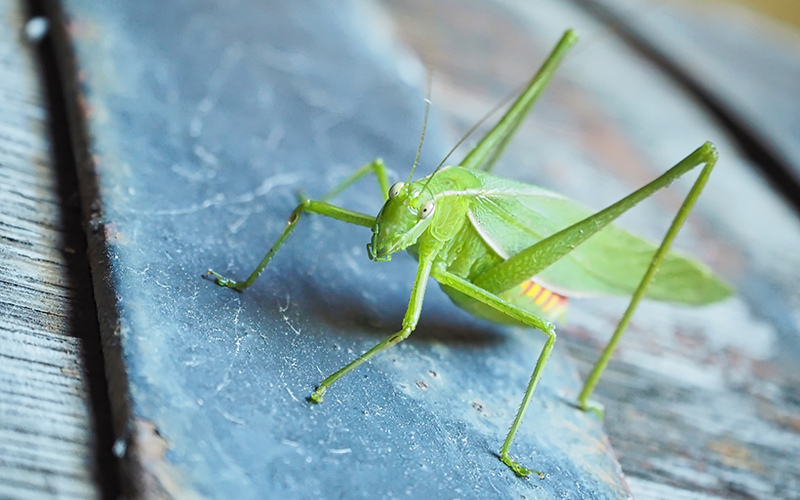 Two familiar names for them include Katydids and long-horned grasshoppers. Bush crickets also live in tropical areas like Southeast Asia and Colombia where this study is taking place. They’re defined by their powerful, narrow hind legs and a high-pitched chirp that you either love or hate. But scientists are interested in them for another reason. They want to learn more about these little critters’ ears, which are not located on the cricket’s head where you might expect them. Instead, they’re right below its knees on its front legs. Who knew? The bush cricket was a prime candidate for this study not only because its ears function similarly to a human’s. It also has a translucent body. That means that in bright light, and under magnification, you can see through its outer shell to view the inner workings without harming the insect. Biologists, physicists, and engineers from the United Kingdom (UK) are working together on this one. Their goal is to develop a hearing sensor based upon how the bush cricket hears. Similar to a human ear, the bush cricket ear includes a cochlea. This is a shell-shaped component of the inner ear that has tiny hairs that receive and respond to sound. It has an outer ear to capture sound from the environment. It can analyze audio frequency much like a human ear can with its middle and inner ear. Scientists will use a non-invasive laser to measure cricket hearing processes. They’ll apply what they learn to develop a 3D computer model of it. This model with be used to help engineers create a sensor that can function like the cricket’s ear. Researchers expect this to have a broad range of applications across sound-related industries: music, broadcast, theater. We’re particularly interested in how this may further hearing technologies. Human hearing is very complicated. Even with devices like cochlear implants and hearing aids, hearing is never 100% like it was before hearing loss. Sometimes you have to choose between clearly hearing a person you’re speaking with or hearing what’s going on around you. It can impact how you enjoy music or a movie. Some frequencies may seem distorted or missing because of damage to the inner ear. Remember those tiny hairs in the inner ear that move with sound waves? If they die, they don’t grow back. Hearing aids will only be able to work with what’s left. And cochlear implants that bypass the tiny hair cells to stimulate the auditory nerve also have limitations. If this study leads to the development of a new type of sensor, it may be able to artificially replace the tiny hairs you’ve lost to restore a more genuine level of hearing through a next generation of hearing aid. We look forward to seeing how this study progresses.